My parents really liked the new caregiver and she took exceptional care of our mom and dad so my husband and I started 2017 by visiting my son and the family in Nevada for ten days. My daughter-in-law had made plans to make our visit a fun and relaxing one. Both she and my son took off of work to spend time with us. My honey and I spent our last night at the El Dorado in Reno in one of their spa suites. We had really worked hard on getting caught up with laundry and house cleaning and organizing before we left. While we were gone, one of my sisters came over and dusted, vacuumed and generally cleaned everything so we returned to a nice clean house. The year was starting out well even though my hubby had a lot of doctor's visits in January. I was tired of the gastrointestinal issues that had me cancelling plans at the last minute and I finally had time to make an appointment with a specialist toward the end of February and set up future dates and times for the many tests he ended up ordering. I felt like I was beginning to decompress. I started to breathe again – slowly. As dad was celebrating his 90th birthday in February, his friends wanted to make it special. 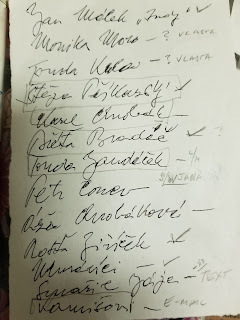 Dad had me come over and started writing down the names of the people he wanted at his party. He wanted me to make sure that they all showed up so I started making phone calls. Most of the people on the list were already planning on being there, but I had to call and make sure per dad's instructions. Dad kept adding more people to the list and so I made more calls. I enlisted the help of some of the people that were taking care of most of the plans for this celebration for my dad. I have to say that most of the people dad wanted at the party were there. Only a few couldn't make it because they were out of town/state/country. Many people worked on making this a special day for my dad and our family is so very grateful. There were around 100 guests at his party and his musician friends played his favorite songs and performed funny 'old people' skits. Others cooked and baked and everyone contributed time and money to make this a truly memorable day. He was, also, awarded a special medal from Chicago's Czech Consul General for his work at Radio Free Europe and keeping the Czech culture alive in the Chicagoland area. Let me share with you this video of his party that our friends were able to put together and edit for a memorial service earlier this year. My dad had always said that he would be here until he was 100. How could we know, that a month and a half after his party, he would be gone. In March, a severe storm damaged our roof and siding. I had to deal with the insurance company and the contractor to try to get it fixed as water leaked from the ceiling every time it rained and it rained quite a bit and of course the insurance company (in the fine print) was not responsible for any further damage even if they were the cause of the delays to the repairs. To get away from all the stress, I went to visit my son and his family in Nevada. I have to say it was great seeing my grandchildren and spending time with my son and my daughter-in-law (her mom had passed way in January and her dad was now living with them). However, one week into my 3 week stay, I fell and broke my shoulder. I continued to cook for them mainly with my granddaughter's help. Even a painful (the only pain killer I could tolerate was ibuprofen) broken shoulder didn’t get me a reprieve. The morning after I flew home, I had an appointment to see an orthopedic surgeon in the morning and had to go with my dad to his doctor’s appointment in the afternoon. The next day, right after my early morning physical therapy, I had to take my dad to see his eye doctor. And so it continued for the rest of the year. I spent 1/3 of 2016 in hospitals, doctor’s offices or at physical therapy – half for me and half for family members. Add to that my family’s non-medical items that I had to attend to (for my parents and sister Paula), I spent 1/3 (4 months) of my year taking care of other people’s issues (based on what I had written into my calendar). 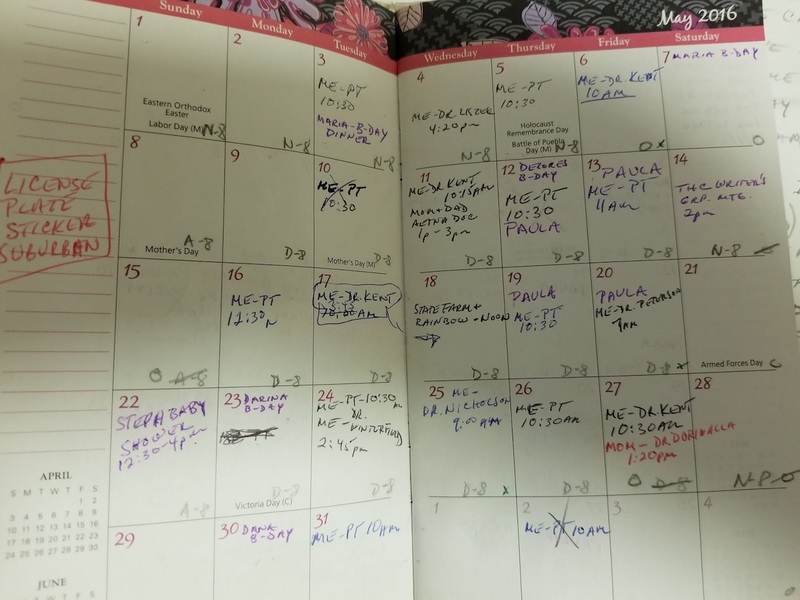 Not everything was written into my calendar, i.e., many phone calls to my parents’ new medical insurance company to get them to cover my parents’ visits and calls to agencies looking for a new caregiver for mom (her social worker was not happy with the care she was getting and gave me a list of state approved agencies to call). 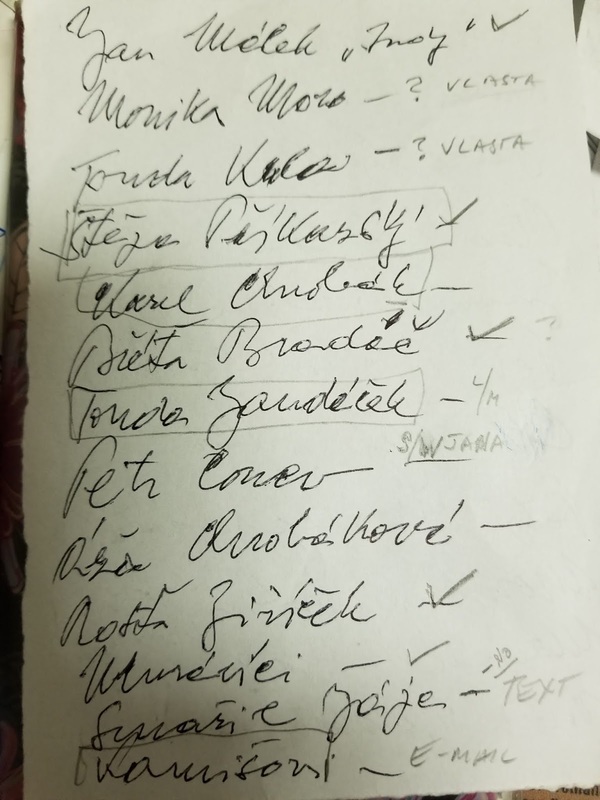 I was, also, putting out feelers for a caregiver who could speak Czech. We got a new agency in May and then a friend found us a Czech speaking caregiver which the agency subsequently hired in June. The damaged roof and siding finally got fixed in August. After haggling with the insurance company and the contractor, I then had a problem getting a permit from the town to make the repairs. Along with many auto repairs in 2016, we had to have our old 1930’s furnace replaced and added central air (for my health issues). For nine months I felt like I had been so compressed by stress that I couldn’t breathe. I was just putting one foot in front of the other. I had to get through this – there was no choice. The last 3 months of the year, the stress finally started to lift a little. I finally had some time to spend with my extremely tolerant husband and we concentrated on getting caught up with housework - something that had been neglected out of necessity for 3/4 of the year. I ended the year with four medical appointments in the last week (mom, me, my sister and dad). Needless to say, there was no time or energy to write.